Hungary is both quintessentially central European, and also very unique. With a long and varied history, this landlocked nation between Austria, Slovakia, Ukraine, Romania, Serbia, Croatia and Slovenia has a lot more to offer than just Budapest. Start here with my basic Hungary travel tips, or jump down below to read my latest Hungary travel blogs. Like much of central Europe, Hungary has mild springs, hot summers, colourful falls and bitterly cold winters. To experience the beautiful nature that rural Hungary has to offer, summer is no doubt the best time to visit, but in the cities, especially Budapest, you’ll find cool things to do all year round. Lake Balaton – The largest lake in Hungary and popular resort destination for the region, there are several towns worth visiting, mostly along the southern coast of the lake. Siófok is a good place to start for a relaxing, lakeside break with beautiful views, easy access to watersports and in high summer, some of the best nightlife outside of Budapest. Eger – A gorgeous town in north-eastern Hungary, this place will fulfill all your Disney fantasies of small town Europe! Despite being relatively small, it has a lot to see, including 17 baroque churches, its own Turkish baths and beautiful winding streets of the Old Town. It’s also right in the heart of one of Hungary’s most well known wine producing regions, meaning you can spend a pleasant afternoon touring wineries and getting just a bit drunk! The Danube Bend – An iconic natural landmark along the famous Blue Danube, the sharp bend that the river makes just north of Budapest is a nice place for a day trip, and the town Vác, on the bend a good place to stop off and explore its charming streets. A popular way to tour through Hungary is on a Danube river cruise taking you through northern Hungary, but hiring a car and driving yourself through this diverse country is also a good way to go. If you don’t feel like driving, the country is well connected by trains and since it’s relatively small (about the size of Maine), you can easily visit many places from Budapest in a day. Take a look at this selection of Hungary tours. By European standards, Hungary is a relatively conservative country, though this is changing slowly. 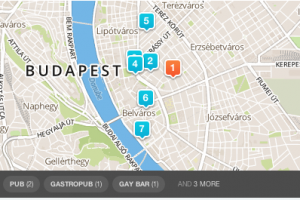 Since Budapest is the capital and largest city in Hungary, it’s no surprise that most of the country’s gay life is concentrated there, and in fact most of the other cities in the country are so small they don’t even have one gay bar! Outside of Budapest, Hungary still has plenty of cool hotels and hostels worth checking out, and if you’re feeling more adventurous, there are loads of great campsites and more rural places to stay too. In the cities, though, I’ve found using Booking.com, Agoda.com or Hotels Combined can be useful for finding last-minute deals.